Dichanthelium dichotomum. early season form.By Arthur Haines. Copyright © 2016.New England Wild Flower Society.gobotany.newenglandwild.org (Accessed 3/2016). Dichanthelium is a genus of C3 Grasses (Aliscioni et al. 2003) with two forms during the growing season: A taller, early season form in which the inflorescence is extended and wind pollinated, and a shorter, late season form from an overwintering rosette of shorter, wider leaves, in which the inflorescences are enclosed within the leaf sheaths and the florets are self pollinated. 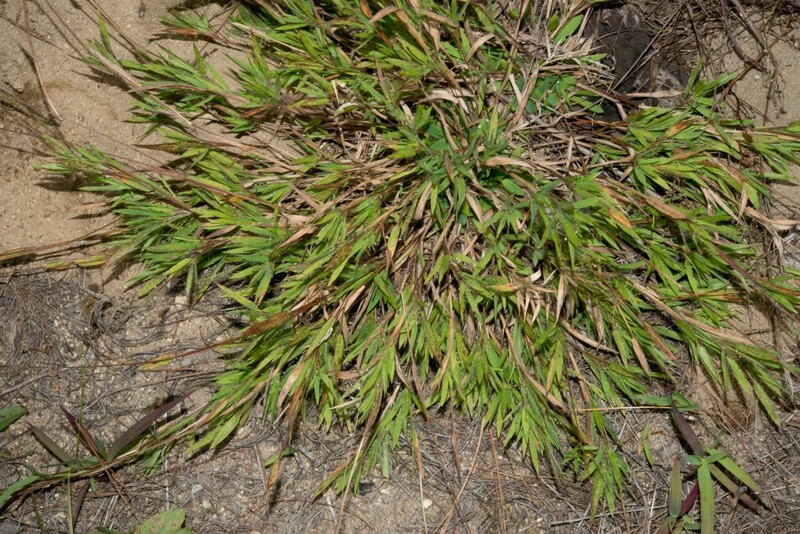 The late season forms are often sprawling with inflorescences at the ends of the stems amid many small leaves . Dichanthelium dichotomum is the model (Type) species on which the genus is based (Reznicek et al. 2011b). Dichanthelium acuminatum.late season plant form.Dunstable Conservation Land Map.© FloraFinder.com. All rights reserved. (Accessed 3/2016). 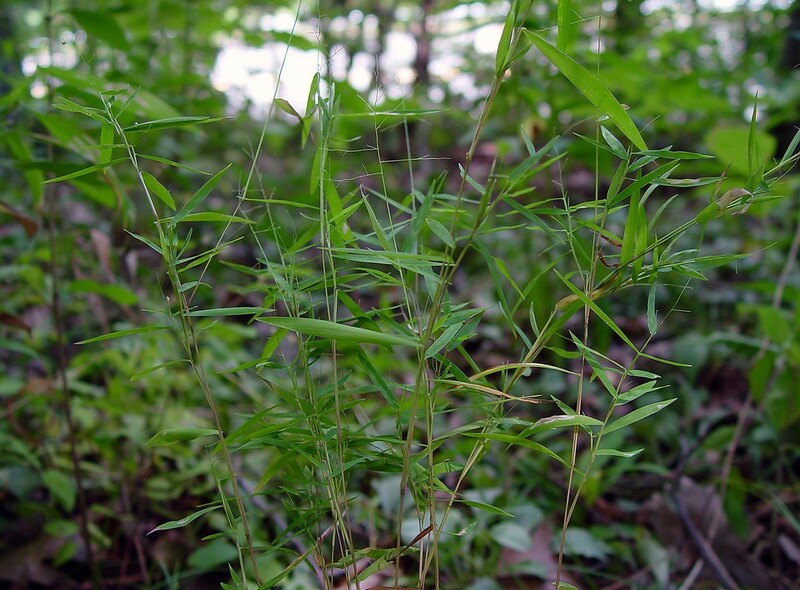 Leaves generally rather short and broad, with those of the late season smaller than those of the early season (Reznicek et al. 2011b). 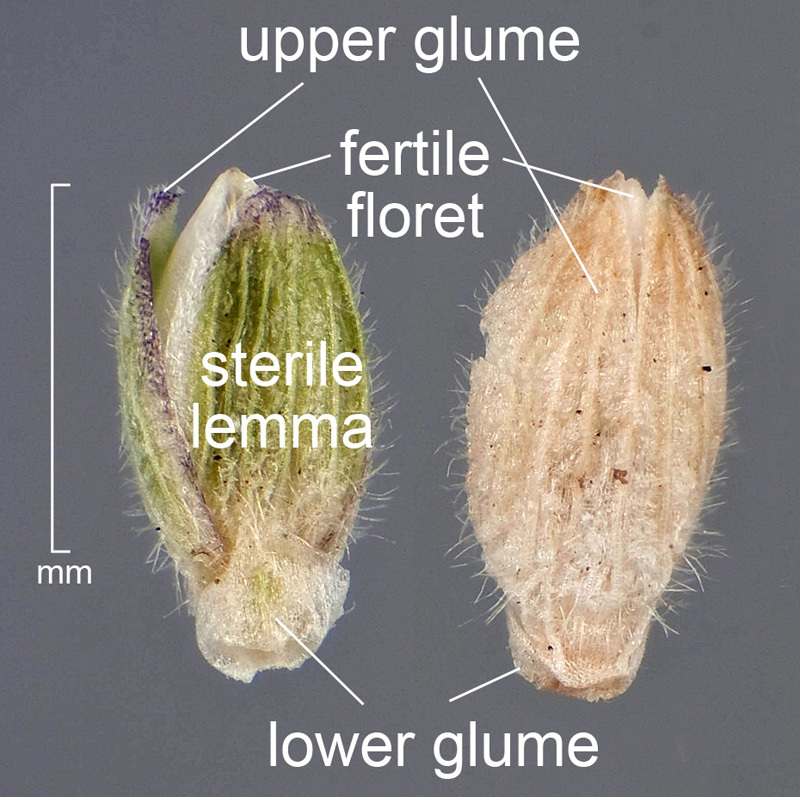 Dichanthelium acuminatum labeled spikelet. D. Walters & C. Southwick. Identification Tool to Weed Disseminules of California Central Valley Table Grape Production Areas. idtools.org (Accessed 2018). Flowers much like those of Panicum. Florets dry, papery, spikelets without awns, terminal flower with both stamens and ovary (perfect), other flowers below it may be empty or with stamens only; first bract of the whole spikelet (first glume) usually very short to tiny, second glume about the same length as the entire spikelet, green or colored usually with prominent veins; outer bract (lemma) of the fertile floret hard, pale, inrolled over the innermost flower bract (palea); inflorescence branched (a panicle) or spike-like (a raceme, in which each spikelet has a short stem). Appearance of inflorescence is generally delicate with florets well defined. Fruit a 1-seeded grain. Spring florets often do not produce fruit.